Detroiter Mike Kinsley on His Roots, Punditry, and Battling Parkinson’s Disease. A national journalist, commentator, television host, and political pundit, Michael Kinsley’s memories of his childhood years in Detroit are recalled with impressive clarity. By the time Mike turned 12, the Kinsley family had moved to Birmingham — “Suffield Road, between Maple and Quarton,” Kinsley offers, also remembering the exact number of that house. Soon after, he enrolled at Cranbrook Schools in Bloomfield Hills. All made possible, Kinsley asserts, by the school’s rigid curriculum. Kinsley entered Harvard University in 1968 and, soon after, rose to the prestigious position of vice president of the school’s daily newspaper, The Harvard Crimson. It was there, he says, that he first began to muse about a venture that would be his alone. “I think it’s fair to say every journalist thinks of starting a publication of their own, where you don’t have to report to a boss. I guess I was one,” he says. Kinsley’s career at The New Republic began auspiciously, when he was only 25, after he returned from Oxford and while he was immersed in his third year as a student at Harvard Law School. He was named managing editor and promptly moved from Cambridge to Washington, D.C., where he got right to work at the magazine and also earned his juris doctor degree by taking evening courses at George Washington University Law School. “The New Republic was the closest thing to (The Spectator and The New Statesman) in this country,” Kinsley says. So began his peripatetic journey through the better part of the next 20 years as the Beltway’s resident contrarian: He was the author of his magazine’s TRB column, moderator of William F. Buckley’s Firing Line, co-host “from the left” of CNN’s Crossfire, and had several short-lived stints with Harper’s and The Economist, as well as authoring numerous opinion pieces for a variety of newspapers and magazines. 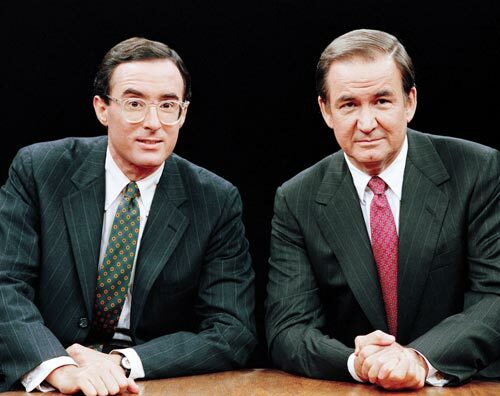 With every word he wrote, Kinsley solidified his reputation as a leading political commentator and a figurehead of the journalistic establishment. But it all came at a cost: The dream he once had of running his own publication seemed distant and elusive. Then in 1994, at age 43, Kinsley learned he had Parkinson’s disease. Which is how his online Slate magazine was hatched in June 1996. It was mission accomplished for Mike Kinsley. He ran his own magazine his way for six years, until turning over the editorial reigns in 2002 and slipping back into his current role as a columnist (for Vanity Fair) and omnipresent pundit, offering his views from a familiar left-of-center perspective. Kinsley hasn’t returned to either of his old neighborhoods in years, but he’s optimistic about the place where it all began for him. “You’re always reading about (the renaissance of Detroit), but somehow it never quite happens. But I sure hope it does,” he says. During Kinsley’s first visit to Microsoft headquarters on that summer day 20 years ago, an executive named Patty Stonesifer was one of the many who interviewed him. She clearly made an impression. Ditto for him. They were married six years later.